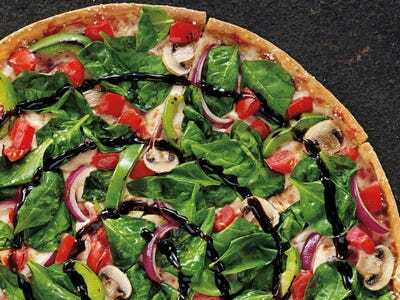 Pizza HutPizza Hut’s new ‘Garden Party’ pizza, launched as part of the biggest brand overhaul in the brand’s history. Settle into Wednesday with the most important advertising stories from the last 24 hours. 1. The world’s largest ad has just been switched on in Times Square, New York City. The Clear Channel billboard is the length of a football pitch, and Google is understood to be the first brand advertising on it. 2. Clothing retailers are using “skinny” mirrors to get customers to spend more money. So far, most of the orders for the Skinny Mirror have come from small boutiques, but the company’s CEO tells Business Insider she is now in talks with a popular apparel chain that has more than 450 stores worldwide. 3. Facebook has taken a step towards its own original content by creating a breaking tech news feed. FB Techwire aims to pull journalists away from whittling away most their time hunting for stories on Twitter, but also signals Facebook is looking to position itself as a publishing platform in its own right. 4. We’ve taken a look at the things that would never have happened in the Steve Ballmer era at Microsoft. Some of the big changes under Satya Nadella have included giving away Office for iPad for free, featuring an iPad in a promo video, getting behind the “internet of things,” and starting to cure a cut-throat culture. 5. Urban Outfitter’s CEO Richard Hayne has identified the brand’s biggest problem after the company reported another drop in sales and disappointing profits. He admitted the team did “a poor job” of designing the architecture of the store and creating different assortments for different types of stores. 6. Manchester United confirmed on Tuesday the financial cost of failing to qualify for the Champions League this season: At least £43 million. The drop is reflective of missing out on bonuses from sponsor Nike, as well as declines in income from broadcasting and matchday ticket sales. 7. AOL’s CEO Tim Armstrong has spoken to USA Today. He talks about programmatic video ads, women in tech and fends off questions about a potential merger with Yahoo. 8. Digiday has taken a look inside Pizza Hut’s biggest ever rebrand. The overhaul includes new ads, a redesigned logo and lots of changes to the menu, including new artisanal pizza flavours. 9. UK retailer Argos has created a Tinder-like gift finder app, Marketing Magazine reports. The app allows people to swipe left or right to indicate whether they like a gift or not, and it then determines which products will be most appropriate. 10. Yahoo has integrated Flurry into its advertising system, giving marketers an option for in-app mobile video ad buys, Adweek reports. The move comes four months after Yahoo purchased Flurry for a reported $US200 million to $US300 million.